I don’t go by Oyidiya because I don’t have the patience to teach all of you how to pronounce it and I personally prefer Ezinne. My mother named me that. My dad gave me the other name because as his first daughter it’s required that I take his mother’s name. He forced me to use the name that begins with “O” when I was in boarding school or what most of you recognize as high school. I didn’t really care. But when I moved to America, I decided to switch it up. No way was I going to be called the O-name. It had to be Ezinne all the way. For the most part it’s worked out fine. Nobody ever gets it right on the first try. I sometimes purposely watch them struggle to figure it out without offering any assistance. I never imagined there were so many variations to Ezinne. But there are. Anyway. My trips to Starbucks which have annoyingly increased lately due to unforeseen circumstances have forced me to pick up another name. I always wondered what it would be like to have a name that was devoid of any ethnic undertones. I’ve always liked traditional ones like “Margaret” or “Agnes”. I even have a soft spot for “Ramona”. But neither of those names will work at Starbucks because for some reason they are universally incapable of spelling anything that contains too many syllables. So, I decided to start afresh. I walked in, placed my order. And when they asked my name — I instinctively replied Ali. When my order is ready and they yell out “Ali” I proudly walk over and pick it up. As people watch me, I wonder if they think the name I gave myself matches my disposition. 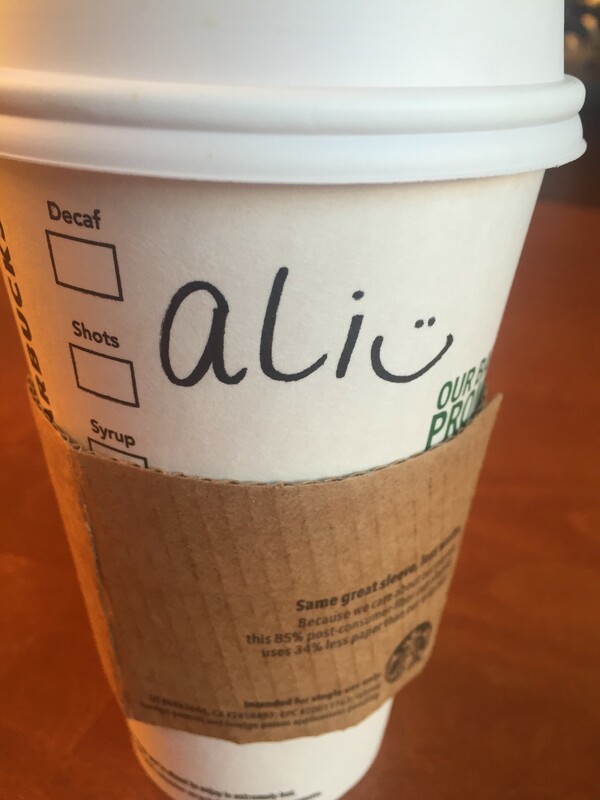 As long as I’m in Starbucks, Ali will have to do. It’s the only name that consistently appears on my cup exactly the way I birthed it. I tried “Tamara” once and it didn’t work. She spelt it “Tamra” even though I clearly didn’t pronounce it that way. There was also the time I wasn’t asked what my name was which I didn’t even notice until they handed me the cup. 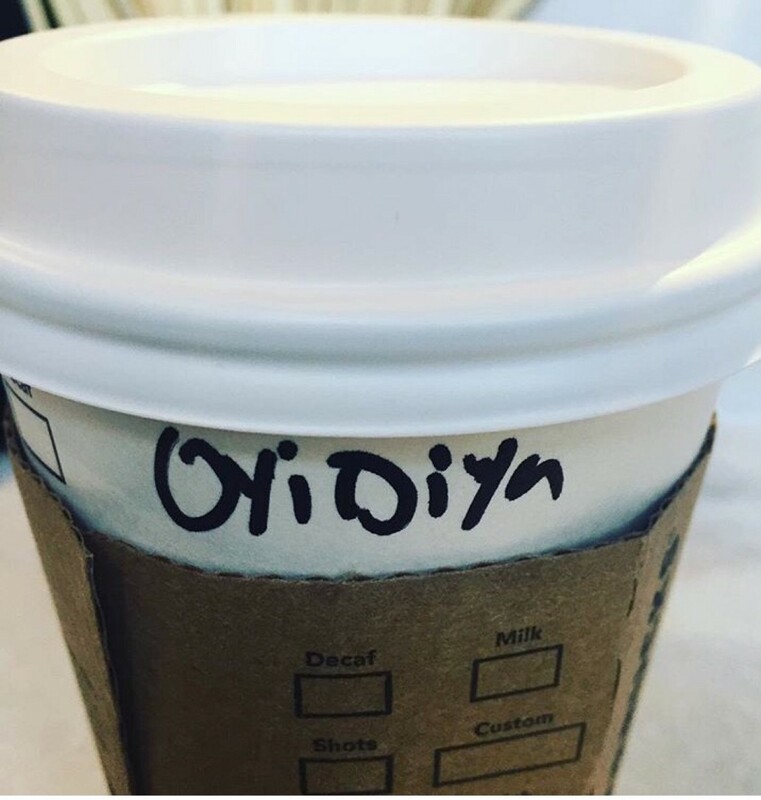 “Oyidiya” was written out as if I had done it myself. He had obviously copied the name on my debit card. But even more fascinating was how well he pronounced it. It sounded beautiful. And for a moment — I considered resurrecting it. But when I’m outside the confines of America’s legal addiction — ”Ali” doesn’t translate. The other day, at the cafeteria, as I pulled out my card to pay for my breakfast, the cashier asked: “Is it Ali or Alli?”. I gave her a stupefied look and she pointed to my Starbucks cup. I defiantly replied, “No. It’s Oyidiya”.